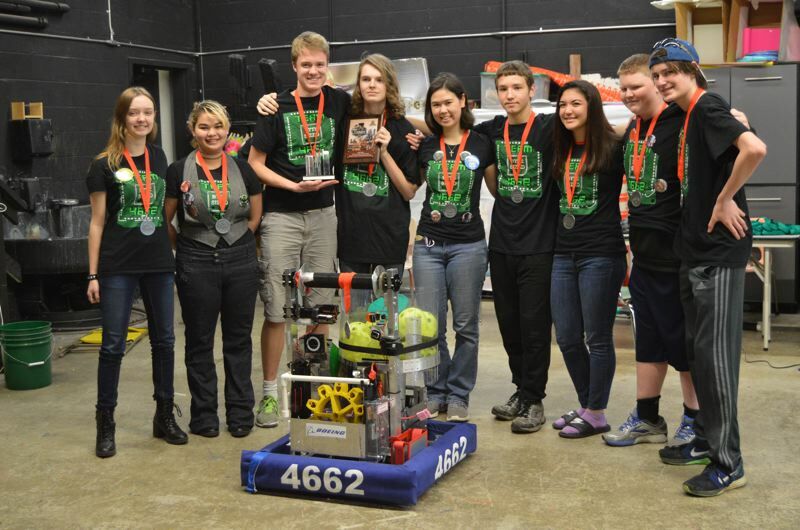 The Scappoose High School Robotics Club earned a second-place title during the first competition of the season at Clackamas Academy of Industrial Sciences on Saturday, March 25. The team, which goes by the name Byte Sized, has been competing in FIRST Robotics competitions for several years, but last week's silver-medal finish marks the highest ranking in team history. In FIRST Robotics competitions, teams are tasked with creating an autonomous robot that can maneuver around obstacles and complete tasks. Team alliances are selected and the teams engage in multiple battles over the span of a weekend. During those battles, the teams earn points by completing various goals, like shooting balls into a basket or loading metal gears onto a platform. robot's toppling were sufficient to qualify for second place. "We had a pretty good run up to that point," Beau Groom, senior, said of the mishap. "At first we were upset, and then we just kind of accepted it." Team members said they were excited and thrilled about their accomplishment. Last June, the group of seniors who helped found the club graduated and, at the start of the season, some club members were concerned about how they would fill those shoes. "We're excited that we got to a point that we've never gotten before," said Hayden Liao, a senior on the team. Now that Byte Sized has taken home some hardware after the competition, its members are ecstatic about doing better than they ever have before. Liao said the team also owes a lot of its success to the newer, younger members who have stepped up. Next, the team heads to Lake Oswego High School to compete over the weekend of Friday and Saturday, March 31 and April 1, where three Columbia County high school robotics teams will face off. The St. Helens High School Robotics and Engineering Club, or SHREC, and the Vernonia High School team, the LoggerBots, will also be at the competition. For the three high schools, it will be the final competition of the season where they will try to score enough points to qualify for the Pacific Northwest Regional Championships. The teams must earn a total of 80 combined points in a competition season to qualify for district championships and are given two competition events to do so. Currently, Scappoose and St. Helens are neck and neck in the statewide rankings at 75th and 76th place, respectively. The teams have also score similarly in terms of points. Scappoose has earned 38 points, while St. Helens has earned 36. Sophomore Trent Lamont said he is looking forward to the competition this weekend as an opportunity to take home another team trophy.